(NO 3023 1888) Denmuir and remains of Dunmore (NR). The barn and granary of the existing steading of Denmuir represent the remains of a late-seventeenth-century two-storey house, formerly known as Dunmore. Above its entrance is a small armorial panel of the Paterson family, who have owned the estate since the time of James III. On the upper floor is a simply moulded seventeenth-century fireplace, inserted within a still older and wider fireplace. A Laing 1876; RCAHMS 1933, visited 1925. Dunmore House. The remains of a rectangular building which has been completely altered to suit the requirements of the barn and granary. Internally, part of the E wall has been removed to enlarge the barn. All sides except the S front have been altered and the windows filled in. 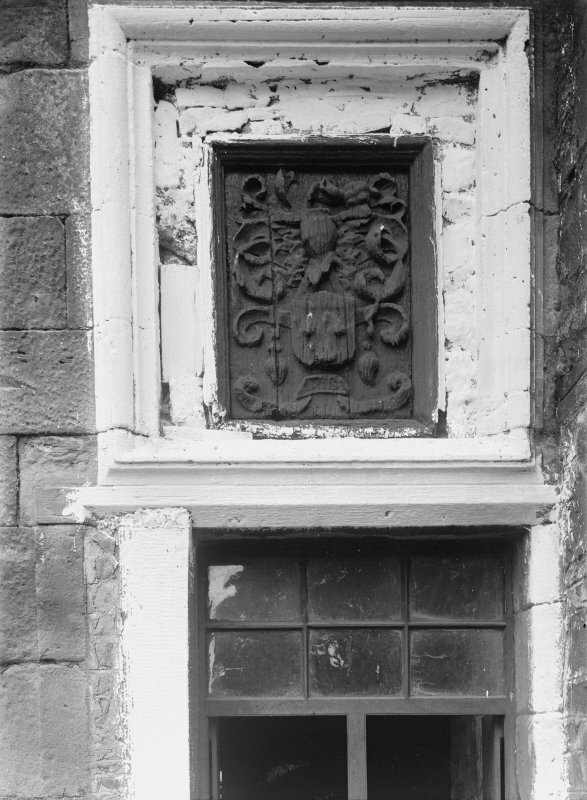 The armorial panel in the projecting entrance is dated 1635. The present name of the farm is Denmuir. Visited by OS (J L D) 30 October 1956. This is a much altered seventeenth-century, formerly domestic, range with a nineteenth-century water wheel for threshing and a twentieth-century grain dryer. Its flanking ranges house byres and stables. There is an extensive roofed cattle court to the east, which was said to have had the largest pantiled roof in Fife.